Yeas, Goof uses a litter box. I mean, he can. He usually does. I would not like to mention uncommon accidents. They still happen. So, can ferrets use cat litter? Are the pellets designed for cats safe for your pet? Is training experience complicated? Let’s go into details. Do Ferrets Have to Be in a Cage? What Bedding is the Best for Ferrets? How Often to Change Wood Pellet Cat Litter? How to Litter Train a Ferret? Ferrets commonly sleep 14-18 hours a day. The sleep duration depends on your pet age and the temperature in the room. During the winter months, ferrets sleep longer. Furniture like rocking chairs is to be avoided. You can use heavy fabric to staple couches undersides. Additionally, your pet is curious. The ferret can get stuck in a narrow place or check the laundry basket. Goof once did it. I found him just before I put the washer in. Actually, ferrets are predatory animals. They were used for rabbit hunting in the past. According to the research, conducted by scientists from the University of Wyoming, ferrets eat prairie dogs. However, your pet does need a shelter. A dark, warm, soft place to hide away is necessary. Why? 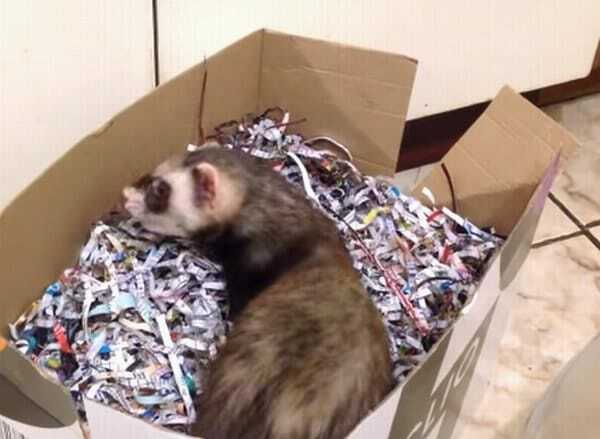 In wild, ferrets were used to sleep underground, in tunnels. So, what is the best bedding for ferrets? It is to be soft and safe to burrow into. An elevated sleeping place like a hammock would be suitable. Thus, a litter pan is to be available in the cage. One per a pet. 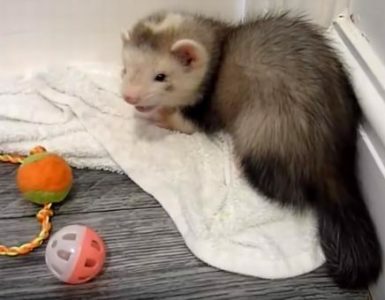 What is the best litter for ferrets? Quite naturally, it is to be safe. But what is the preferable material? So, not every natural material is good for ferret litter. Silica and clay may be too thick and hard. Does your pet like digging or scooting? Ferrets do it to clean their bottoms. It can be not safe with the cement-like litter. Dust may stick to their sensitive paws. Is corn-based litter the best? It’s dust and clay-free. But ferrets eat it. It might cause health problems. For example, intestinal blockage. So, I actually use newspaper pellet litter for Goof. He likes it. What about pellets and shaving? I guess these materials are the best for farming. Horses and chicken would like the bedding. It’s natural and warm in cold weather. Essential oils are great to reduce unpleasant odors. 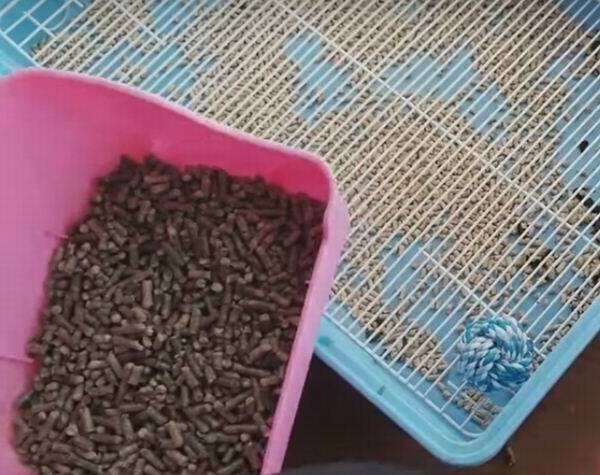 Pine pellet horse bedding for cat litter can be used. It’s pretty safe. Wood is chemical-free. This smell is healthy and clean for people. For ferrets, it’s irritating. Feline pine vs wood pellets are much better for domesticated animals. It’s safe for cats. Shavings are worse. Are pine shavings for cat litter commonly recommended? They are lightweight and absorbent. Additionally, if any fragrances are not included, the odor is not irritating for cats and kittens. It is unbearable for ferrets. The hammock can be washed twice a week. Any disinfectants are to be avoided. I use only water and soap. Meanwhile, the litter can be changed several times a day. Ferrets are very smart. At least, Goof is. So, you can train your pet. How to do it? Place the pan into the cage. Use praise, vanilla, rise methods. In the morning, take the pet out from the cage. Place him to the litter box at once after the walk. The ferret is to understand its benefits. Reward the pet for using the toilet. Spread some vanilla smell near the tray. Ferrets commonly like it. So, can you use cat litter for ferrets? Yes, but only the safe one. I think recycled paper is really the best. Wood pellets for ferret litter are acceptable, if the pet is not sensitive to the odor. However, they are to be made not of conifers. Maybe, from the oak. As to the hard materials, like silica or clay, they are not safe. Ferrets like digging, and they can hurt themselves.